Grammy-nominated violinist Zach Brock, award-winning composer/bassist Matt Ulery and globally esteemed drummer Jon Deitemyer, will be showcasing their critically acclaimed musical venture, Triptych in Fort Collins, Denver and Boulder, Colorado from Wednesday January 25 through Sunday January 29. They will present performances at Dazzle Jazz, The Music District and The Dairy Center for Arts and lead master classes at Fort Collins High School, The Music District, and CSU School of Music. These events are produced in association with Off The Hook Arts, led by Jephta Bernstein (Executive Artistic Director & Founder). 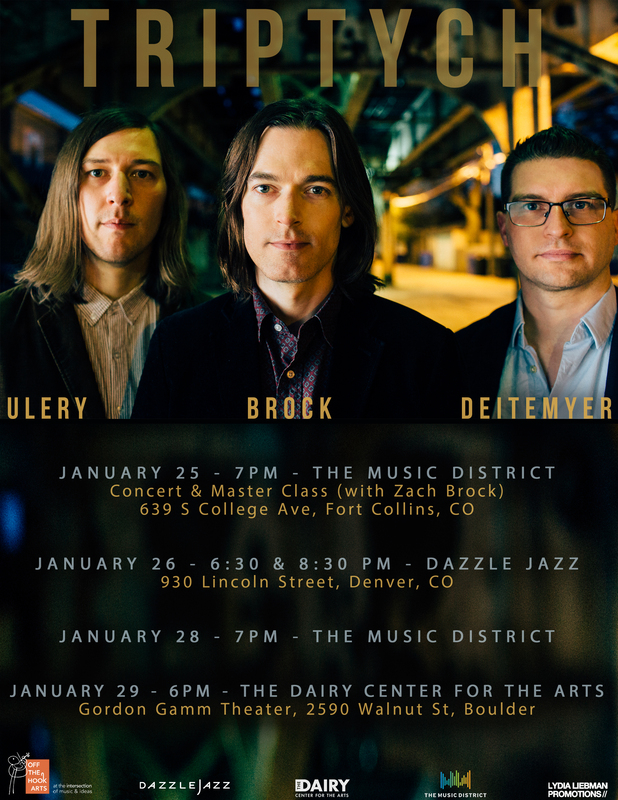 On Wednesday January 25, the group will hit the ground running with four separate masterclasses given at Fort Collins High School, CSU School of Music, Theatre and Dance and The Music District; the final masterclass that day will be presented by Zach at The Music District, located at 639 S College Ave, Fort Collins, is open to the public with tickets available here. Triptych will then perform alongside the Fort Collins High School Jazz Band from 11:50am – 1:15pm on Thursday January 26. That evening, the trio will make their way to Denver, where they will perform two sets (6:30pm & 8:30pm) at Dazzle Jazz, located at 930 Lincoln Street. On Saturday January 28, Triptych will play a 7pm set at The Music District. The tour will then be brought to a close at The Dairy Center for the Arts, Gordon Gamm Theater, located at 2590 Walnut St, Boulder with a 6pm set on January 29. Zach Brock has been described as “the pre-eminent improvising violinist of his generation”. With The Chicago Tribune acknowledging Zach’s recording “Perpetuity” as one of it’s “top ten jazz recordings of 2014” and Downbeat Magazine labelling Brock it’s “Rising Star” violinist of 2013, these shows are not to be missed. Zach is also known to have successfully collaborated with legendary bassist Stanley Clarke, Grammy-award-winning ensemble Snarky Puppy and jazz extraordinaires Phil Markowitz and Dave Liebman. To add to his repertoire of success, Zach has represented the U.S. Department of State as a Musical Ambassador in the Solomon Islands and has featured as a soloist for two Sundance Festival feature film scores. Currently, he is Philadelphia’s Temple University’s Boyer College of Music and Dance’s “Artist in Residence”. Downbeat Magazine has recognised Chicago-based bassist/composer and bandleader Matt Ulery as establishing “himself as one of the most rigorous, thoughtful and ambitious figures in Chicago’s jazz scene; A composer with a deep curiosity and an ability to deftly assimilate his wide interests”. His music is informed by the entire spectrum of jazz, classical, rock, pop, and folk– specifically American, South American, Balkan, and other European folk styles. He is a multi-instrumentalist, performing on upright bass, electric bass and tuba. Under Dave Douglas’ Greenleaf Music record label, Ulery has produced and released 6 albums of all original music including his three most recent releases of critical acclaim, “By a Little Light,” “Wake an Echo,” and “In the Ivory”. Like Zach, Ulery has collaborated with a range of prestigious musicians including Kurt Rosenwinkel, Phil Markowitz, Jimmy Chamberlin, Fareed Haque, Howard Levy, Patricia Barber, Goran Ivanovic and Jeff Parker. As a composer, Ulery has teamed up with ensembles such as eighth blackbird and the New Millennium Orchestra of Chicago. When Matt is not extensively touring the U.S. and Europe, he is a particularly familiar face to the Chicago music scene. Having graduated from the University of North Texas, Jon Deitemyer has developed himself as one of the most creative and expressive jazz drummers on the scene today. In his short music career to date, he has proved himself as the drummer of choice for a vast array of incredible musicians. Deitemyer has collaborated with Patricia Barber, Matt Ulery, Zach Brock, Grazyna Auguscik, Phil Markowitz and Ben Paterson, amongst many others. Deitemyer has performed in South Korea, Brazil, Poland, Germany, Lithuania, the Czech Republic and Canada, as well as in the United States. Recordings of his drumming can be heard on the Concord, Greenleaf, Origin, and MaxJazz labels. Alongside his professional performing and recording career, he is also an active educator, with teaching positions at Loyola University Chicago and the Chicago Academy for the Arts. Tickets available here (Student and general admission available).